FNS (French Naval Ship) Mistral is now at Singapore to take part in IMDEX Asia 2011 after completing Kochi, India visit (from May 05 to 08, 2011). Russia is very keen to buy/construct this class of ship from France. Carry out amphibious and air support operations. Provide command and control support. The biennial, 8th edition of IMDEX Asia is to be held from May 18 to 20, 2011 at Changi Exhibition Centre in Singapore. Asia Pacific’s only international exhibition on maritime defence with active support from the Republic of Singapore Navy. to bring together more than 150 of the world’s leading maritime defence companies. to showcase the latest maritime defence technologies and developments in 7 country pavilions. to be exhibited in an area of over 120,000 sqm of indoor space. To be represented by the warships from Australia, France, India, Indonesia, Republic of Korea, Malaysia, New Zealand, Russia, Singapore, Thailand, UK, USA. Indian Express reports that India is expected to invest USD 46.96 billion in the next 20 years to modernize the Indian Navy. 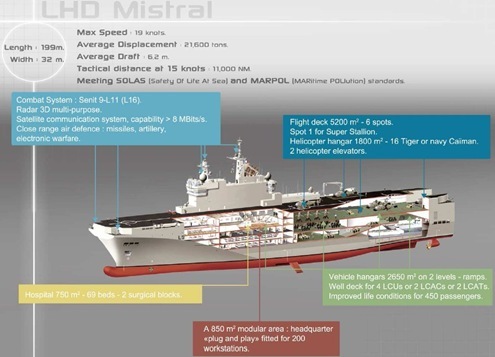 It is high time for India to build Mistral type multipurpose helicopter carrier. Here is a graphical presentation of French Landing Helicopter Dock Mistral (L9013) from Marine Nationale, France. For more details on exhibition, log on to IMDEX Asia 2011.